Holy Guacamole! Gigi is A M A Z I N G!!! 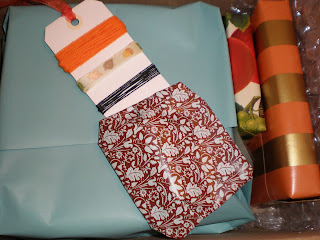 Her "Tags and Swags" swap package was the most incredible present ever. EVER! Her talents are endless. I could smell both the tags and the swag the moment I started opening the box- yummmmmy! Look at her box- it was awesome before it even began. And then, a note warning me to open with care. I was so nervous as I had no idea what it was but knew it smelled good enough to eat. 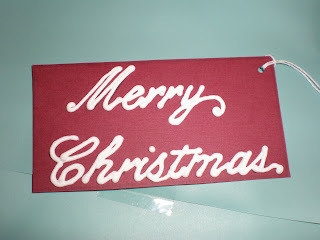 She made these tags using (I think) royal icing on card stock. Brilliant! That never occurred to me before but the result was stunning. You must have a very steady hand Miss Gigi. The tags were a hit with my family at Christmas too. 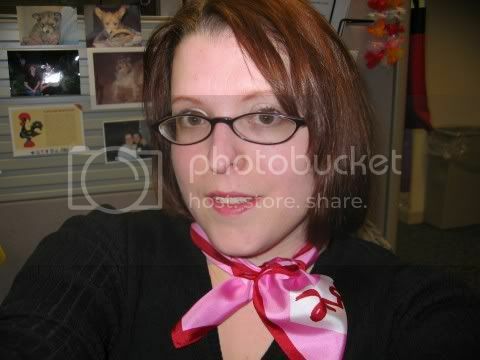 Although I must admit I was very very selective as to who and what gift was given one of those special tags. They were for adults only as I knew the kids could care less. 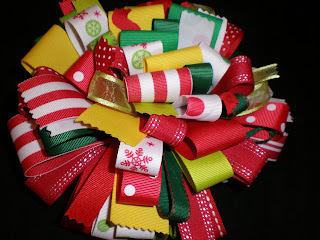 I was a little bit of a tag hoarder- I just love LOVE them soooo much! 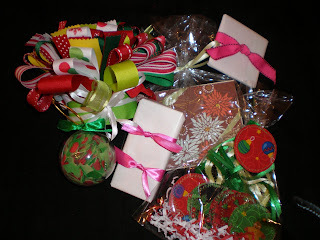 I next opened the other fun goodies such as a personalized tag full of fun fall ribbon and strings, cookie cutters and my new favorite lippy in Twizzlers flavor. Mmmm! I saved what turned out to be my swag last. Talk about saving the best for last. Look- just look! 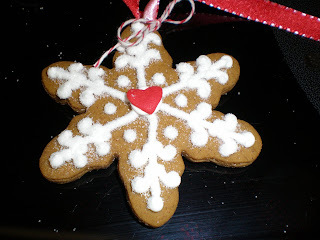 A breathtakingly beautiful and absolutely delicious tasting swag of gingerbread cookies! So detailed and just divine! I tried hanging it up for the entire season but truth be told, gingerbread is a personal favorite and well....it was just too yummy to make it un-touched through Christmas. And I reasoned that it would likely not all stay in-tact if I attempted to save the cookie swag. I just cannot tell you though how much I adored this gift- it was more special that I could have ever imagined!! Thanks Gigi!! 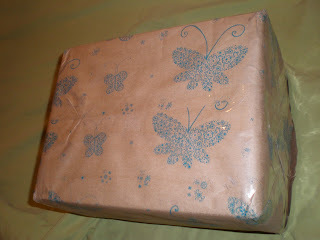 So in return, I sent her this very belated package. The swap was supposed to last a total of three months but due to my overwhelming to do list before I left for Hawaii (and then again after I returned from Hawaii) and a sewing machine that stopped working and the purchase of not one but TWO new sewing machines that were both duds (both Singer with Martha's mug shot on them- ugh- will never buy Singer again- soooo disappointing! )...our swap only just ended this week. I seriously have the sweetest and nicest swap sister in the world for being so patient with me. 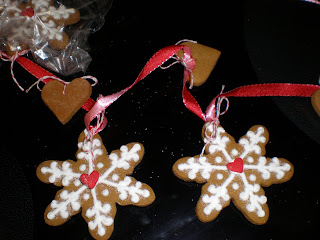 While I think my goodies were fun to give, nothing compares to my royal icing tags and cookie swag. But hopefully she enjoyed it anyway. Since we were both late in sending and since she doesn't really decorate much for fall, her gift was pretty much all Christmas. The only exception was a set of note cards in fall-ish colors and a little set of cheese spreaders. 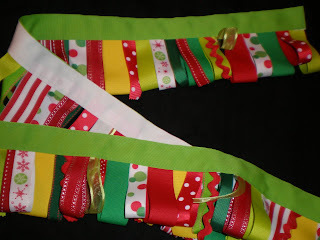 The tags were holiday fabric on one side and card stock on the other- sewn with a zig zag stitch and a ribbon to tie. 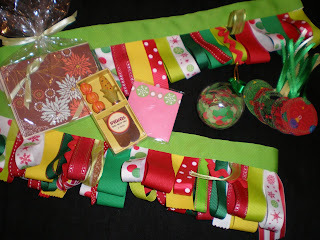 The swag was my favorite part and something I have played with for other projects on a much smaller scale. She said it was her favorite part too- I love the way she described it- very Dr. Seuss. It totally is very Seuss-tastic! I also loved it rolled up and thought if she didn't like/need it as a swag it might look cute in a glass as a table decoration. Both you and Gigi made incredible packages! 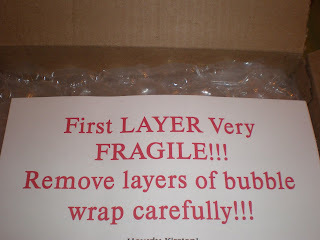 I'm so glad you enjoyed our swap!